What memories. Ilford Broadway, waiting for a SA to Barking Park. Manor Park, just missed a 663 for Mile End? Never mind, there is another at 'The Rabbits'. Stratford on misty winter afternoons with the pointsman in his canvas hut outside Boardmans. Bell punch tickets, salmon coloured three-halfpeence child. Waiting outside the Spotted Dog Upton Lane for a 687 to take the corner too fast and break the 'fairy lights'. Trolleybus 1745 [GLB 745], an SA2, has come from Barking Broadway through Longbridge Road, Fanshaw Avenue, and Ilford Lane from where it has turned right to head eastbound along Ilford High Road through Seven Kings and Goodmayes to Chadwell Heath. The building to the left with the scaffolding is the fomer Black Horse public house and is currently the Woolwich Building Society. The road patter in this area has changed enormously. This part of High Road is one way wetbound only, and traffic arriving from Barking along Ilford Lane then enters the western end of Winston Way and then onto the western gyratory of Chapel Road and Ilford Hill before entering Cranbrook Road [the road opposite the former Ilford Lane]. The trolleybus on the opposite side of the road from 1745 is an SA3. I've been looking at your very interesteing website, being an ex resident of Ilford/Manor Park. I remember all the palces shown in the various photos and, in particular, Picture No. 540 appears to show my late father's cream-coloured Ford 8 at the traffic lights at Ilford Broadway! I can't read the number plate properly, but our car was FXL 379, which looks like the number of the car in the photo! Would it be possible for you to confirm this for me - I can't get a clearer image on my screen, and also, if it is the car, would you be able to provide me with a copy of the photo. Many thanks for the very interesting memories. Frustratingly this particular picture was scanned in from a postcard print as the negative is unfortunately missing. Like you I can't be absolutely sure of the index plate number since it could be FXL 379 or, sadly, more probably FXL 579. I came across your interesting website by 'accident', but have enjoyed looking at and reading it very much. As a youngster I lived in Seven Kings, next to Ilford, which was then in Essex but is now part of the London Borough of Redbridge. I used trolleybuses to go from Seven Kings into Ilford [I cannot remember the route number], which I believe operated out of a garage in Ley Street, Ilford. I remember that they seemed very large, with two axles at the back. Some years later I was told that these particular trolleybuses were unique; they were a batch built for South Africa but not delivered due to an export restriction by the Government. As a result they were de-tropicalised [hence I was told the reason for the size of the vehicle] and used in Ilford. They were wider, at seven feet, than the current laws permitted to be used on the road and special dispensation was given to allow them to be used. Do you know if this was true? The one thing I do recall was the ugly 'mess' of columns and overhead cables that ran along the roads, especially at the cross roads at the top of Ilford Hill and the junction of Cranbrook Road. The overhead view was one of heavy points assemblies and twin wires going all over the place to enable routes to turn into each of the four roads. I now live in Croydon with the new trams and the overhead structures are not as obtrusive to the street scene. 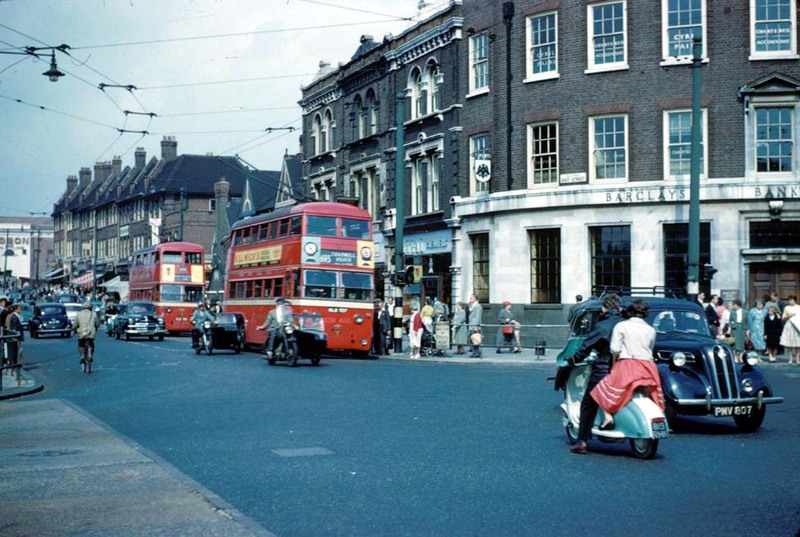 Picture RH15 is a 1959 view of East Street, Barking at the junction with Ripple Road, and the closer of the two trolleybuses is probably SA1 class #1727 of the batch originally intended for Durban and the second an SA3 originally for Johannesburg. The overhead emerging from the left of the picture is from the London Road terminus of routes 691 [Barking to Barkingside] and 693 [Barking to Chadwell Heath]. These traction wires are hardly visible and you also have to look quite closely to notice even the traction support poles. The picture of Ilford Broadway at the top of this pager has more noticeable overhead wiring because of the junction at that location but at the time such a 'wirescape' was considered quite normal. 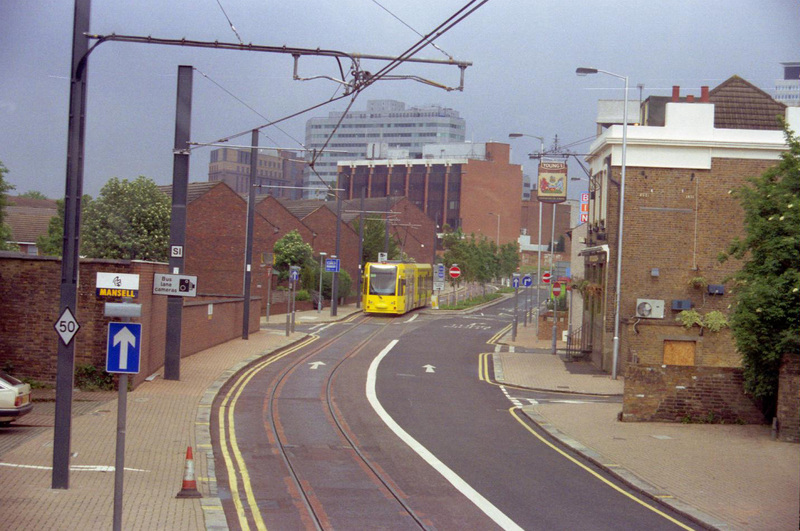 It is an interesting comparison that Derek Squibb's makes about the 'skyscape' of trolleybus wires compared to the overhead now seen on Croydon Tramlink. 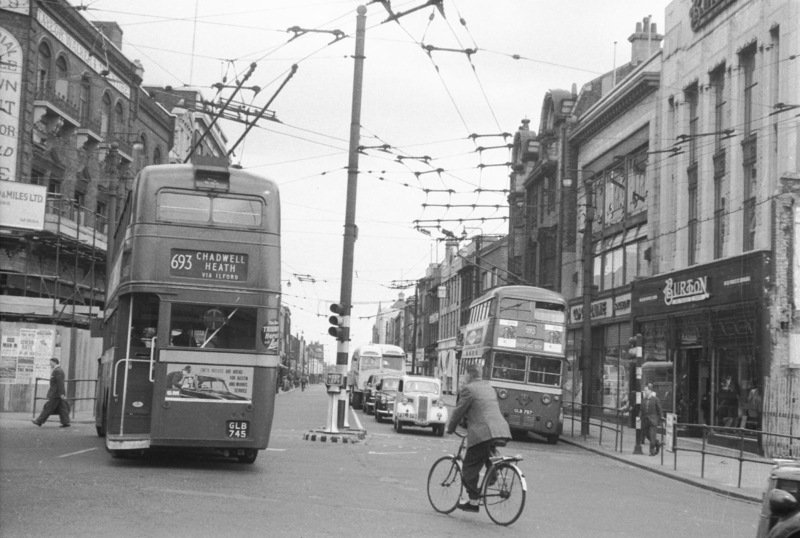 However, there are very few junctions on Croydon Tramlink whereas the 250 miles of trolleybus overhead that once existed in London supported a multiplicity of routes that created the need for some quite complex junctions, but as a general rule we could say that trolleybus overhead simply melted into the background. With much higher tensions, and supply voltage, the traction support poles for Croydon Tramlink have to be more substantial than the previous generation of poles, and, for economic reasons, steel stanchions are used rather than the more aesthetic circular poles. Consideration also has to be given to the implication of a single traction support being damaged through impact with a heavy goods vehicle. The contact wire is required to be as near horizontal as possible and there is also a need for it to 'zig-zag', so all in all a very much more 'chunkier' overhead is the result. I therefore find it difficult to accept the premise that it is not so obtrusive as former trolleybus wiring. Picture 1015 supports this argument. As fascinating as your site is,in your picture of Ilford Broadway a paragraph by Morris Hickey states the building on the left with scaffolding is the Black Horse which was to become the Woolwich Building Society. It was in fact the White Horse PH and is now a Barclays Bank&semi; the Black Horse PH was situated almost directly across from it and only closed in recent years. It is now a bookmakers.